In a first for the ecommerce sector, MakeMyTrip, India’s biggest online travel company, is rolling out an in-app live travel gameshow–Knock-Knock–to drive customer engagement through travel bids, deals, rewards and games. The 30-minute live show, which will be anchored by television celebrities Gauhar Khan and Purab Kohli every Sunday starting April 7, will include live bidding for travel deals, quiz contests, travel entertainment content and a jackpot prize offering international holidays. “The idea is to acquire new users while driving long-term customer retention,” says Rajesh Magow, cofounder of MakeMyTrip. As smartphone penetration further drives growth for online travel bookings in India, travellers frequently turn to mobile devices for planning– whether it is inspirational travel research, planning an existing trip or booking a last-minute getaway. “We want to inspire, engage and delight our customers,” he adds. Some of the prizes to delight the users include a five-star retreat stay in Maldives, return air tickets to Istanbul for two, an all-inclusive holiday deal for Bhutan, business class return air tickets for two to Paris, and holidays in Andamans. 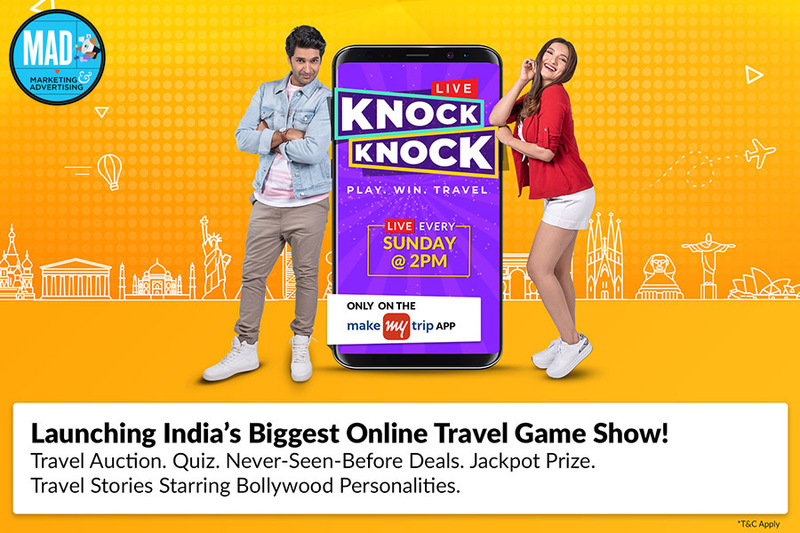 Billed as the biggest online travel gameshow in India, Knock Knock will try to increase engagement, which in turn would spur higher category reach and booking conversion, reckons Saujanya Shrivastava, group chief marketing officer of MakeMyTrip. Mobile is the new reality of digital India. Four in 10 Indian online travellers booked flights via smartphones in 2017, and the share of mobile hotel bookers was even higher at one in two, according to a report by travel industry research firm Phocuswright. As travellers continue to migrate to digital, mobile gross bookings is likely to grow in double digits each year to reach $9 billion by 2022.